How Ljubljana Biennial of Graphic arts penetrated the public space? The known fact is that around one-hundred- twenty Biennales small and large are existing in the world today. Some are simple, down-to-earth national events, while others are global blockbusters gigantic and international in scale and fantastic and overreaching in goals as they chase the mirage of “globalism.” Compared to these overextended events, the Ljubljana International Biennale of Graphic Art is practical and sobering realistic. Launched in 1955, long before today’s ubiquitous – and illusionary – theme of globalism, Ljubljana Biennale has contributed to the democratization in the production and consumption of art. As long as modernist thinking dominated in art, Ljubljana did well. Biennial was representing »a graphic map of the world« as it’s conceptual leader liked to emphasize. With the emergence of new artistic practices, and postmodern thought Biennial’s rigid organizational and theoretical structure has become a problem. By gradual fusion of art with science in the so-called electronic world of utopia, the organization has become an obstacle to the survival and development of event.In order to survive, Ljubljana Biennial was forced to adapt to the demands of art production, changing under social, political and economical circumstances in the age of information galaxy. The conceptual change was introduced with the 24th Biennial in 2001. The revitalisation of the Biennial was supposed to be a process that proved the structure of the event, internal organisation, relations with domestic and foreign audiences and curatorial work, as well as ways and places for presentation of art. In a period determined by new technologies these modifications were introduced with the aim of accentuating the topical character of printed arts and revitalising the strength of the event itself. In contrast with the previous Biennials, the content of the 24th event brought to light the artistic, social, political and economic significance of the precisely repeatable mass circulating visual information and fine art image. Biennial was divided into two curatorial exhibitions . Print World that I curated was installed in gallery premises and the other, Information-Misinformation, curated by Hans Ulrich Obrist and Gregor Podnar in cooperation with the Vienna museum in progress has found it’s place in information and announcement mass media such as newspapers, radio, television, digital information screens and advertising hoardings. In this division met two important aspects of contemporary art – intra and extra muros element. One segment of the Biennial was therefore moved into a public space out of gallery wall and even more than that. Biennial has also crossed the concrete territorial borders of the event it took place simultaneously in cities and media outside Ljubljana. The passing of physical borders of the event and penetration into different public spaces became a constant at Ljubljana Biennial up to now. It has become an element of pursuit of new spaces from where art can address broader, even anonymous audiences. In my presentation I want to share our experiments and experience in placing graphic art in different public spaces in the city of Ljubljana in order to raise awareness on Biennial event and engage broader public in contemporary art contents and artistic meanings. M. Sc. Breda Škrjanec (1960, Ljubljana, Slovenia) graduated from the Faculty of Arts, University of Ljubljana, with a degree in art history and sociology. She received her master’s degree in art history with a thesis The History of the Ljubljana Biennial of Graphic Arts. She is a museum counselor at the International Centre of Graphic Arts (MGLC), taking care of the collection of prints and artist’s books. She has prepared a number of exhibitions , including, My Altamira, The Spirit of Image (China), From the Cradle to the Grave, selected drawings by Damien Hirst, Point d’Ironie, The Partisans in Print, Bienal de Cerveira, outdoor projects (Spain), Edward Zajec, the Artist and the computer, FV Alternative Scene of the Eighties, Drug As Art (China), etc. She was the first appointed curator for the Ljubljana International Biennial of Graphic Arts in 2001, when Ljubljana Biennial’s structure was remodeled and has co-curated it twice more (2005 and 2007). 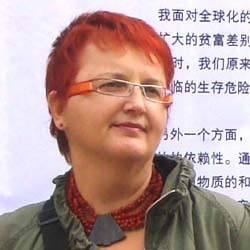 She was a member of several international juries and a project manager of several European projects funded by EU program Culture. She writes articles and gives lectures on art history and visual culture at home and abroad.